The School of Biological Sciences Gender Equity and Inclusion Committee was formed in September 2017 and meets monthly. The Committee's role is to monitor and establish (if needed) policies and activities to facilitate gender equity and inclusion within the School. Gender equity and inclusion is a set of actions, attitudes, and assumptions that provide, as far as possible, equal opportunities for and equal expectations of individuals, regardless of gender, race, culture or sexual identity. It affords a framework for an inclusive productive working environment in which all individuals can achieve their best and diversity is valued. The broad aim of the Committee is to advance the representation of under-represented groups across all levels within the School and implement, as far as is possible, the principles of gender equity and inclusion. We aspire to achieve a School where the diversity of members reflects the cultural diversity of Australia overall and includes a minimum of involvement at all levels of governance and membership of the school of 40% men and 40% women. Do you have a question or concern about gender equity and inclusion in the School? Do you have a suggestion for how challenges can be overcome? Please send us an email at: sci-biol.gequityin@monash.edu. The School of Biological Sciences values everyone equally and is committed to ensuring that our School is a safe and inclusive place for all students and staff. Should staff or students need support, please contact any of the members of the Committee (listed above), my office, or University services. 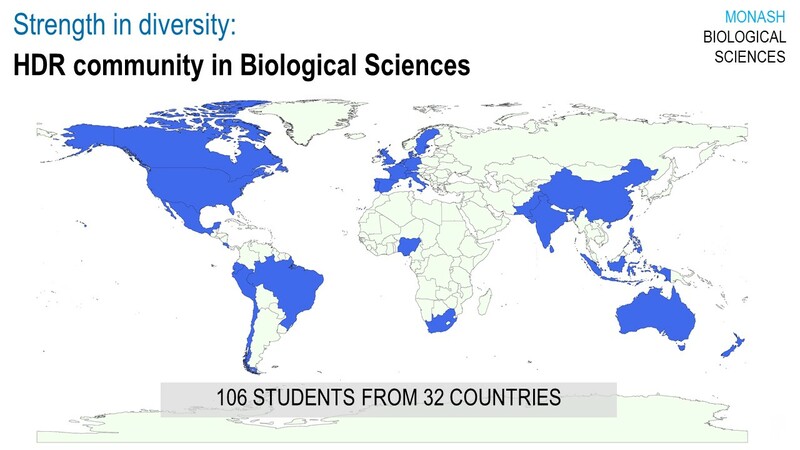 The School of Biological Sciences is committed to providing a work place that is productive and enjoyable for everyone, regardless of gender, sexual orientation, disability, physical appearance, body size, race, nationality or religion. Each member of the School has a responsibility to act in a way that fosters a positive experience for all members of the school and those that interact with it. All school members are required to read, understand and follow this Code of Conduct. School members will treat others, including other staff and students, with respect, dignity, consideration and courtesy. School members will comply with the law, and in all their dealings with others behave honestly and ethically and respect individual privacy. This includes not photographing or recording any individual without consent. School members will refrain from any form of behaviour that may be perceived as intimidation, harassment, a threat or otherwise cause a person to fear for their safety. School members will not engage in acts of bullying, aggression or violence. School members will respect the rights of others to work and study free from discrimination and harassment, including sexual harassment. Harassment includes inappropriate physical contact, unwanted sexual attention or innuendo, deliberate intimidation or stalking. It also includes offensive comments related to gender, sexual orientation, disability, physical appearance, body size, race or religion. Sexist, racist, or exclusionary comments or jokes are not appropriate. School members who witness violations of this code have a duty of care to report the behaviour to the School. We do not tolerate harassment in any form. Anyone who wishes to report a violation of this code is asked to contact, in confidence, the Head of School, the School Culture & Inclusion Champions, or a senior colleague that you trust.